The fee for a birthday party rental is $200. Prepayment is required for all rentals. Checks should be written to: Morris County Park Commission. A $50 dollar security deposit is required in a separate check, which is returned at the end of the period. Reservations are confirmed upon receipt of payment. There are no cancellation refunds. The Great Swamp Outdoor Education Center in Chatham Twp. offers a fun and educational birthday parties for children 4 and older. 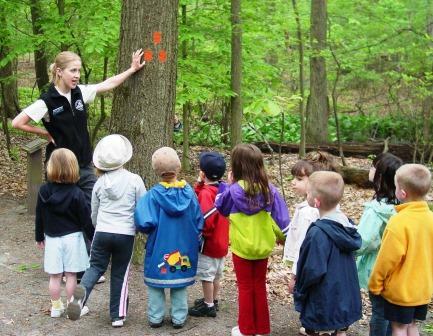 Seasonal Nature Walk: Kids enjoy walking with a naturalist who points out the wonders of nature in a variety of habitats. Nature Scavenger Hunt: Adventurous children work in teams to search out the “treasures on the trails” during an educational nature walk. Meet the Animals! 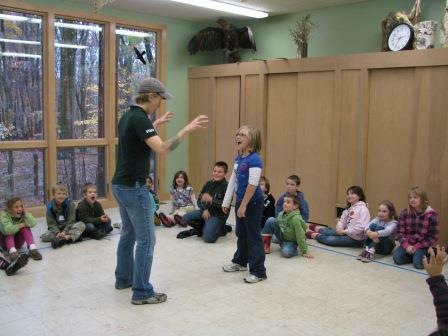 : Kids view a variety of LIVE animals up close, including reptiles and invertebrates. They’ll learn all about their importance in nature and get the chance to touch each one! Nature Detectives: Who’s been roaming the trails? Party guests solve the mystery as they search for animal signs, homes, sounds, and other clues left behind by our wild residents. Bird Brained: Your party guests learn what life is like as a bird. Can they call a mate or keep up with a hungry nest of chicks? They’ll find out through fun games, activities and a walk. Creepy Crawly Critters: Learn all about these tiny creatures by capturing, examining, and releasing real specimens. Your guests leave with a newfound respect for these amazing critters! Lenape Life: (For ages 8 and older, only!) If your child is fascinated by Native American life, this party is the perfect choice. The children try their hands at making rope, play real Native American games, visit a wigwam (only at the GSOEC) and more! • The birthday rental is for a three-hour period including, set up time, clean up time, and a one-hour program with naturalist. • Programs are held rain or shine, and all children are encouraged to dress according to the weather, including good walking shoes or sneakers. • Helium balloons, noisemakers, and piñatas are NOT permitted. • Before leaving the premises, the renters must clean the floor and all surfaces used, remove all decorations, and put recycling and garbage in the outdoor bin. • Parties are available for ages 4 and up only and are limited to a maximum of 20 children, including siblings. • If there is only one person working on the day of the rental, the building mustbe locked when the party is outdoors. Parents or visitors cannot stay behind in the building for the duration of the outdoor program. • All participants must observe the Morris County Park Commission rules. • There must be a minimum of one adult per five children for adequate supervision, not including the naturalist or Park Commission staff. • The rental is limited to a classroom only. Children may enter other areas in the nature centers only if supervised by an adult. • The renters must sign a contract stating they are responsible for any damages to the site or its equipment. The renter is responsible for the behavior of all guests and assumes responsibility for their personal safety.